Another pleasant morning, but no wind ! Probably why there were only 9 starters. Richard S set a short course of 6P 8S 5S 7P with the start line from the club house. For the pursuit race the marks 5 and 7 became irrelevant as the leaders rounded 6 and then only got half way to 8 when the 35 mins was up ! David M (Laser) was over the line at the start and had got half way to the first mark before he realised and turned back to restart, just what you want when there is no wind. 1st Roland & Ryan (National 12); 2nd Eddie B (Laser); 3rd Newton & Ellen (RS 200); 4th Mark B (Laser); 5th Adrian (Rooster); 6th Karen (Laser). First time for a while that Eddie has been on the podium, but have to take them when you can ! The wind improved very slightly for the second race, but even so Mark could not take any more excitement and decided to sit this one out.. Ellen & Newton got a good start at the far end of the line with slightly more wind and were nearly a leg ahead by the time they got to the second mark. Roland & Ryan were going well in second and reduced the gap by half by the end of the first lap. David M came through in third with Karen fourth, Adrian fifth and RSC 21 (Not signed on) in sixth place. Rick (Laser) and Eddie became becalmed and decided enough was enough. A big wind shift at the start of the second lap allowed Roland & Ryan to catch Ellen & Newton before the wind disappeared again and they passed Ellen & Newton on the way to 8. With very little wind Richard sensibly set a finish line at 5 after just 1 and half laps. David made up for his first race and finished a creditable third, which could be his first podium finish. The corrected times on handicap were the same as the finishing order. Thanks to Richard S and the OOD Team James, Chris B, Phil M and Nigel J. It was a pleasant mid- October morning with a light wind which increased slightly as the race went on. Monica had arrived back from her voyages, obviously refreshed and wearing a rather fetching tartan outfit (Royal Stuart I think). There were 20 starters including our resident Mirror fleet of Pat and Gordon. First back through the line was Chris (Comet) followed by Curtis who was giving his Otter an airing (that’s his boat not his pet ! ), Hadey (4.7) was 3rd, Newton &Ellen (RS200) 4th, Mike A (Lightning) 5th and Joe (Topper) 6th. Pat in her Mirror was going well in 7th place but the Lasers were fast approaching. At the gun the final positions were 1st Newton & Ellen; 2nd Chris; 3rd Hadey; 4th Roland & Ryan (National 12); 5th Sylvia (Laser) and 6th Jon (Laser). Pat and Gordon decided it was time for a cup of tea, so 18 set off at the start of the handicap race. Mark B (Laser) was first through the line at the end of the first lap closely followed by Jon, David C (Laser), Roland & Ryan, Adrian (Rooster) and David M (Laser). By the second lap Jon had taken the lead and Roland & Ryan had moved up to 2nd pushing Mark down to 3rd. In mid-fleet Dave L, Sylvia, Hugh and James were having a good battle in their Lasers (well in Hugh’s case it was Dad’s Laser, hence the appearance of the Otter). Behind them Rick (Laser), Chris and Mike A were also having a close tussle and further back Hadey and Curtis were trying to catch Dean & Nick (Vago). At the end of the third and last lap Ellen & Newton crossed the finish line in 1st place with Mark 2nd, Adrian 3rd, Roland & Ryan 4th, Jon 5th and Sylvia 6th. The other movers on this last lap were David M up two places to 8th, James up two to 9th, Chris up two to 13th and Curtis up two to 15th. On handicap the significant changes were Jon up to 3rd ,Sylvia up to 4th and David C to 5th pushng Roland & Ryan down to 6th. Thanks to Karen the SOOD and the team of Stuart, Roland L, Mike T and Bill C.
Not many details I am afraid, but it was obviously the day to be in a Laser, even Franz turned out in his Laser for the first time this series. We actually had a fleet of Enterprises (well two to be precise) again another first time for this series as both Peter R and Jon M turned out. Hugh continued his musical boats routine and was back in his Byte for this one. 1st Dave L; 2nd Hadey (actually 4.7); 3rd David C; 4th; Karen; 5th Jon and 6th Richard S.
1st David C; 2nd Karen; 3rd Ken; 4th Hadey; 5th Richard S and 6th Curtis. Thanks to the OOD Team and sorry that I do not have your names. This particular Jolly Sailor has been away for a few weeks so the race reports are somewhat curtailed and having to rely on information from the race sheets.. There were 15 starters and at the gun the final positions were 1st Ellen & Hadey (RS 200); 2nd David C (Laser); 3rd Steve P (Laser); 4th John H (Laser); 5th Adrian (Rooster); 6th Curtis (Laser). Ian C (Supernova) decided to join the fun for this race (or he was completely missed in the Pursuit Race ! ), so there were 16 starters for the second half. The early leader was David C (Laser) followed by Ian C, Adrian (Rooster), No number Ghost, 67268 Ghost and Steve P (Laser). By the end of the four laps Ian had taken the lead on the water with David in second followed by another three Lasers, James, 67268, No number and Ellen & Newton (RS 200). Curtis (Laser) disappeared after one lap and Dean & Nick (Vago),Paul W (Sport 14) and John C (Topaz) were denied the pleasure of the last lap. The final results on handicap were 1st David; 2nd Ian; 3rd James; 4th Ellen & Newton; 5th Dave L (Laser); 6th David M (Laser). Not sure what happened to the two ghosts but they seem to have been spirited away off the leader board ! There was very little wind today, but even so, 14 boats started both races. Karen (Laser) was the only sailor to complete one lap so not surprisingly she was ahead at the gun. Perhaps more surprising was Steve P in second place, you would think a big lad in a big boat would suffer in the light wind, but it must have been the superior quantity of canvas he managed to get up the pole in his 505 ! In third place were the all-girl crew of Hadey & Ellen in the RS 200 with 4th John W (Laser), 5th Dave I (Laser – good to see you back on the water Dave), 6th Sally (Comet). It was also good to see Jon M back on the water, but having sold his Solo to Newton he was now out in an Enterprise. William came out top of the Toppers followed by Ben and then Joe. In the light winds this was a two lap affair dominated by the girls. Ellen & Hadey crossed the finish line just ahead of Karen, then there was a gap back to James in 3rd, John W 4th and ominously for them Sally in 5th with Jon M 6th. Dave I and Steve P decided one lap was enough for them, but everyone else finished the course. This time Joe took the honours in the Toppers followed by William and then Ben. The final positions on handicap were 1st Sally; 2nd Ellen & Hadey tied with Karen; 4th James; 5th John W; 6th Joe. What a day for the girls, three female helms in the top three places and four if you include Hadey crewing. That must be another first. In the Pursuit Race there were also three women in the top three places ! Don’t forget to sign in on the Declaration Sheet and that includes the names of crew as well as helms. OOD Teams please put your names on the foot of the race sheet – there is a space provided. It would be good to have the course recorded – there is a space for that as well ! Well done to the ladies who finished in the first three places in the previous weeks handicap race. 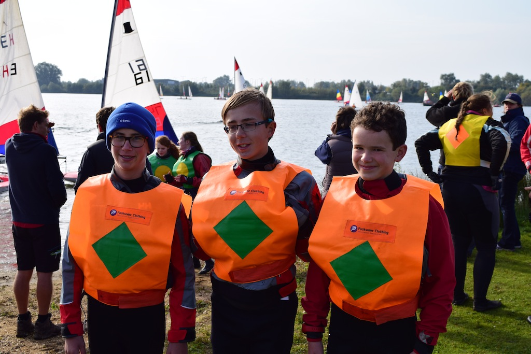 A team of Reading youth Topper sailors consisting of Ben, Joe and William (ably supported by their respective Dads) competed in the weekend just gone in the National School’s Sailing Assoc. single handed team racing event at the Hunts Sailing Club at St Ives in Cambridgeshire. This was a large event consisting of 32 teams from all over the country from as far afield as Plymouth, Barry in South Wales, and Lancashire, but also including Reading’s arch rivals, Claire’s Court, coached by Reading’s very own Vice Commodore – the turncoat ! The weather was fine on both days with a fresh 9-11 mph breeze that picked up during both days. For the event’s size it was very well run with some 160 races sailed over 2 days, in sequences of 6 flights of boats with a constant stream of team/boat changeovers. So the boys had to get their eyes in from the get-go in terms of the sausage machine that was the start sequence. Success came early for Reading, winning 3 out of the 6 races sailing on Saturday placing them 9th overall (and ahead of both of Claire Court’s teams !). However, reality dawned a little on the second day of racing. Firstly, came the news that one of the races had been recorded incorrectly, and in fact Reading had only won 2 on Saturday. Secondly, as the boys faced tougher competition they found out that team racing is about tactics, as well as sailing well. Despite, some hard fought races frustratingly being pipped at the post a number of times, Reading couldn’t add to their overall tally of wins, and so ended the competition well down the field. It was a learning experience for the Dads as well who had a chance to go out on the umpire boats, and pick up umpiring tips as well as some of the finer points of the racing rules – just don’t mention rule 42 to Steve, you’ll never get him off it! At the end of the day, the boys should be proud of their performance, their standard of sailing was consistently of a very high standard throughout 2 days of a fairly gruelling sailing schedule. It is a question of focusing now on the tactics to turn those sailing skills into points. The NSSA and Hunts SC should be commended for staging such a large event and all the preparation necessary to make it go so smoothly. Congratulations should also go to Claire’s Court, whose 2 teams came 12th and 25th respectively. Some video footage courtesy of the official Reading SC Team Photographer – Steve. Usual format, breakfast, bacon rolls etc £2, 0930 race 1100.
if you would like to have break fast. Thank you to everyone who came to the work party today. You all did a great job and achieved a huge amount. This Autumn the Club is again running a series of free and informal race coaching sessions. Run by David Clay with help from Karen Smailes, Paul Robson and Jon Clay, the sessions are designed for members who currently race (or intend to start racing during the autumn/winter) and who want to learn more and improve. The sessions are open to everyone, although it is recommended that you have at least RYA Level 2 (or sail to the same standard). Places are first come, first served and limited to 12 per session. You are welcome to come on 1, 2 or all 3 sessions but will get the most benefit from attending all 3 sessions.